1. The United States’ economy is already operating at close to capacity. Trump’s planned FISCAL package is in reality politically inspired not economically required. As a result, the greater risk is that it leads to over-utilisation and hence inflation. 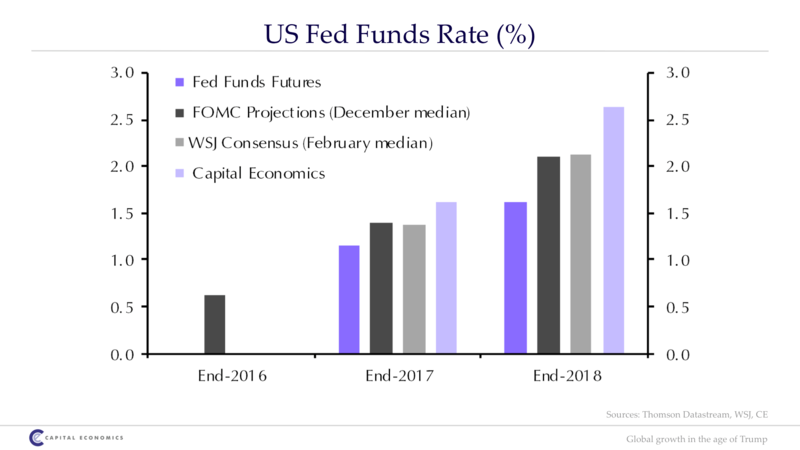 CE are forecasting top of the street rate rises in the US of 100 basis points in both calendar years 2017 and 2018. 2. Rapid regulatory intervention, and the declining pound sterling, will largely insulate the UK from the effects of BREXIT. 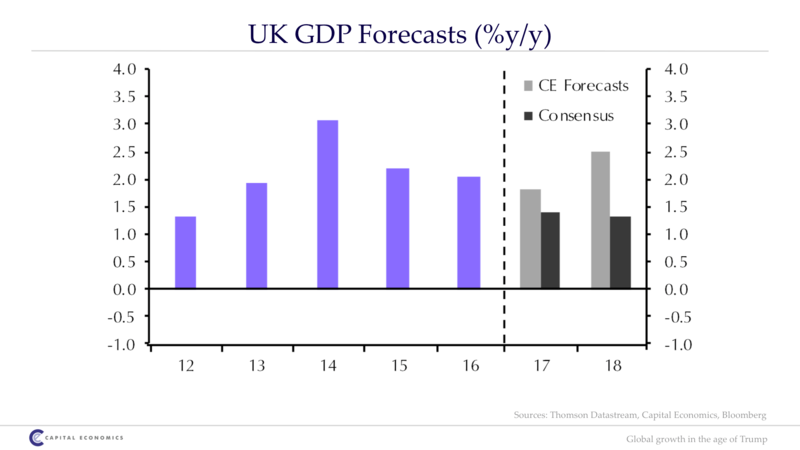 CE is forecasting UK growth to accelerate into 2018. 3. A debt crisis is brewing in China, but it is still some way off. The likelihood of a crisis in China near term is slim. 4. Over the next decade, GDP growth of 4-5% per annum would be a ‘good’ outcome but requires that the Government act (soon) on bad debts, which are accentuating the misallocation of capital. Without proper reform, GPD growth may drop to 2% per annum. 5. More than 30% of all exports are now to China – greater than Japan, the US, Europe, the UK and NZ combined. If China sneezes, forget about a cold – Australia is going straight to the intensive care unit. 6. 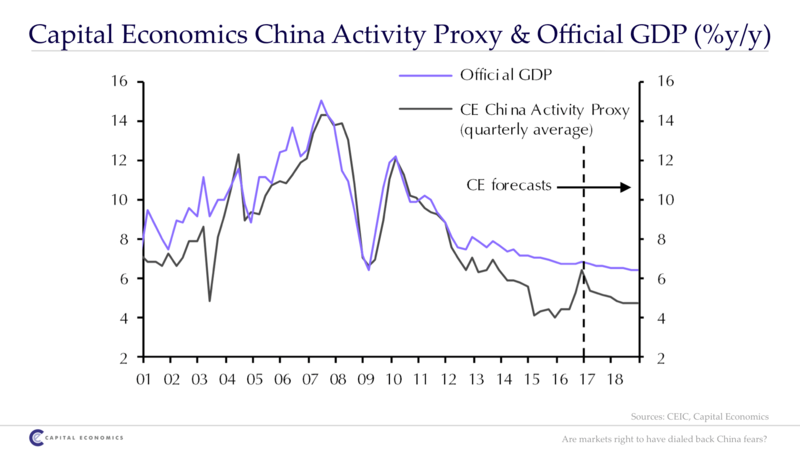 And CE is forecasting that China will sneeze this year and that the iron ore price will exit CY2017 at around $US50 per tonne. 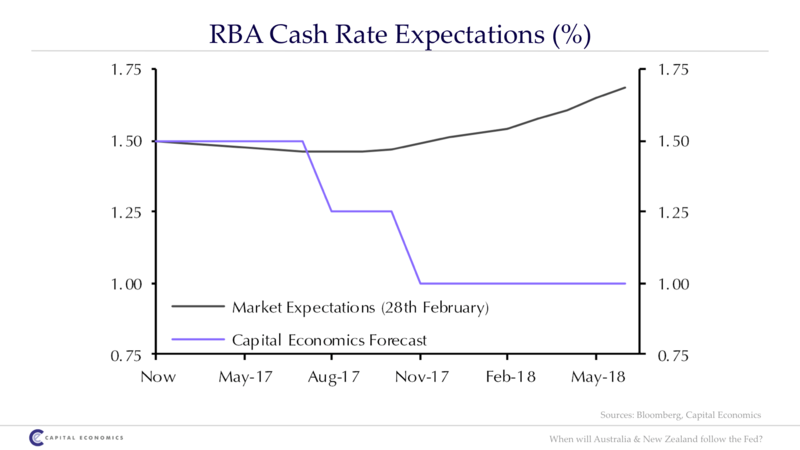 As a result, CE has made a highly non-consensus call that the RBA will drop rates twice in 2017 and end the year at 1.00% - below the official rate in the US. It’s a stretch, but the rationale is valid should China slow infrastructure spending. A key thematic, from our interpretation at least, is that many of the underlying structural issues in the four major global engines (US, China, Europe and Japan) have not been resolved but rather delayed. The outlook for the foreseeable future is positive. 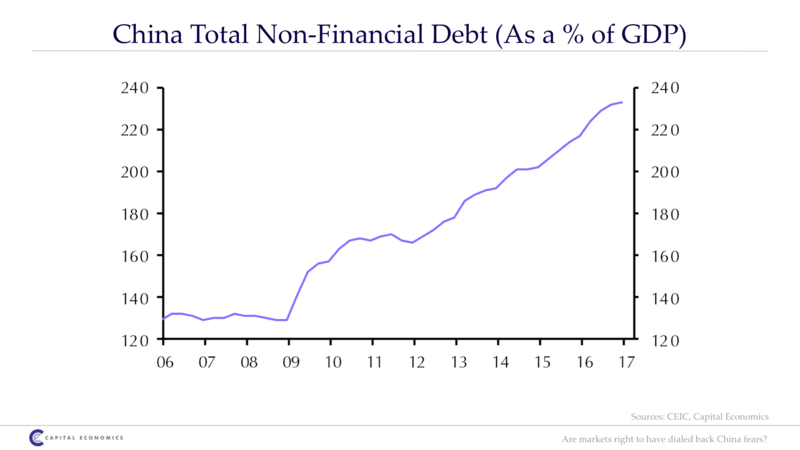 However, at some point – perhaps around 2020 – debt levels, inflation and the structural misallocation of capital will create an even bigger obstacle to global growth than what has been experienced thus far. 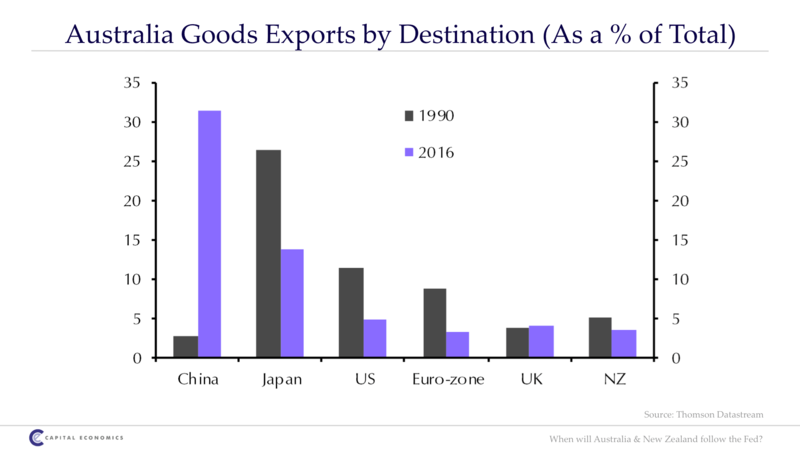 If China, Japan, USA, Europe, UK and NZ take about 60% of our exports, I'd be interested to know who takes the other 40%. SE Asia?